A rack full of Christmas cookies are on display at the Christmas Markets in the Romerplatz in Frankfurt, Hessen in Germany which can be used as decorations. The Christmas Markets in the Romerplatz in Frankfurt, Hessen in Germany is the ideal place to pick up beautifully designed Christmas cookies. The decorations on each cookie varies as some portray Santa Claus while others have shooting stars with stuffed animals adorned in Christmas colours.Iced Cookies at the Christmas markets in the Romerplatz Frankfurt, Hessen, Germany, Europe. 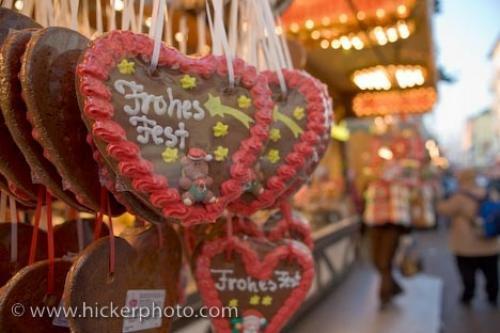 Photo of the decorations on large heart shaped cookies for the Christmas season in the Romerplatz in Frankfurt.